This is a client contract for a consultancy or advisory company undertaking a project with substantial intellectual property, scientific or high technology content. 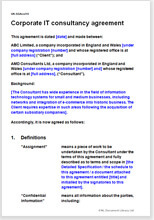 This is a contract for a company that provides analysis and advice around technology. The project or projects for which this contract could be used could be large or small, involving a single employee or a team. The exact work to be done is not important to the legal content of the agreement. We allow you to set it out separately as a schedule to the document. This allows you to keep the subject matter of the project separate to commercial and legal matters, and allows you to reuse the same contract for other projects with the same client simply by reference to the original terms. It favours the consultancy business without being unacceptable to a client. You may use this document as your standard T&C, or you may use it as a discussion document with an important client, edited specifically for a special project. There are options in several areas, notably in the contract summary, payment systems and working arrangements. This agreement is based on our standard one for a consultancy business, but covers more matters related to the protection of intellectual property (such as sensitive data) that are likely to be required by clients. If the business is not conducted through a corporate structure, then this contract is more suitable. In addition, at the end of the document, we provide over 2,500 words of helpful and informative drafting notes that will allow you to edit the agreement to your precise requirements.